Fusion is hot in Paris at the moment, with Asian, African and Latin American-inspired dishes popping up on menus created by French chefs at trendy bistros. And among the popular dishes, raw fish — served as tataki, ceviche or simply tartare — might well top the list. In this version, raw tuna is marinated in a mixture of Asian flavors and set atop a bed of black rice, another new-ish addition to the Parisian culinary repertoire. I was inspired to make this after dining at Le Desnoyez, a moderately priced bistro in the increasingly hip Belleville neighborhood. The chef, formerly a lawyer, creates a new menu every night. Everything is beautifully presented and, in my view, fabulously delicious. The tartare he made on the night I was there featured black rice topped by mulet noir, a variety of mullet that can be served raw. 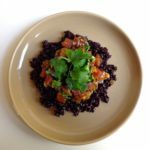 I was blown away not just by the fish but by the black rice, which I had never encountered before. Its nutty flavor married sublimely with the tartare. I phoned up to ask for the recipe, but the chef wasn’t there. So I decided to wing it. 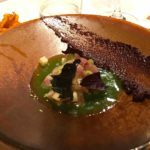 But before I got around to attempting to replicate that dish, I was treated to dinner at another, pricier restaurant, Le Comptoir du Relais, where a ceviche of mulet noir was the first course of a five-course, fixed menu (no choice). The fish, mixed with tiny bits of Granny Smith apples, avocado, celery and cucumber juice (! ), was served in a shallow bowl with a smear of tapenade alongside, as shown in the photo snapped by my friends. As creativity seems to be the name of the game here, I decided to go with a black rice version but to top it with tuna instead of mullet, mainly for reasons of availability. Black rice is produced across Asia and in Italy, and I was lucky enough to find some at a gourmet store across the street. An online search showed that it can also easily be ordered via the web. I picked up the tuna at an outdoor market and made the dish the same day. This entry was posted in 5. Fish and Shellfish and tagged black rice, le comptoir du relais, le desnoyez, recette, recipe, riz noir, tartare de thon, tuna tartare. Bookmark the permalink.